BASIN, Montana (USA) -- For centuries, Tibetan artists using tiny brushes made from such exotic materials as hair harvested in late winter from the scruff of the neck of a feral cat have created intricate religious scrolls celebrating Tibetan Buddhist cosmology. << Tseten Dorjee, a master thangka artist from India, paints one of the religious scrolls Wednesday at the Montana Artists Refuge in Basin. Dorjee and two other Tibetan thangka artists-in-exile are working this summer at the refuge. The scrolls are called thangka, and virtually every household shrine or Buddhist temple or monastery in Nepal and Tibet displays them. This summer, three Tibetan thangka artists-in-exile are working in Montana. Karma Tensum, executive director of the Tibetan Children's Education Foundation in Helena, was instrumental in bringing the artists to Montana. Under the sponsorship of Tensum's foundation, the Feathered Pipe Foundation in Helena and the Montana Artists Refuge, the artists are producing thangka at a retreat and art studio in Basin, about 30 miles north of Butte. Their visit also includes cultural outreach to western Montana communities, including talks and exhibits this weekend in Kalispell and Polson. "In Montana, they have space, material and a tranquil atmosphere in which to create their art, luxuries for most of them in India, where as refugees they are cramped for working space, inundated with the sounds of thousands of people living all around them and struggling to make ends meet," Tensum said. 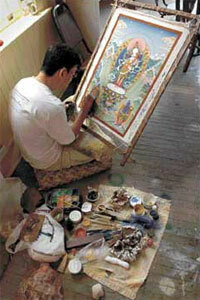 It takes weeks, sometimes months, for a thangka artist to complete one painting. The scrolls are painted on cotton prepared with a grind of yak-hide glue. They are bordered with elaborate silk tapestry and mounted on wooden frames. Thangka is a traditional art form, and is done in the traditional way. There are no gimmicks or shortcuts. It may take seven to nine days just to grind the stone pigments used in a painting, with each successive fineness of grind yielding a different shade of a primary color. Brushes may be only three hairs' breadth wide. Removed from the frames, the thangka can be rolled up for storage and transport - a necessity for the nomadic herders of Tibet, who typically live in tents or yurts, and move their entire household several times a year to find fresh pasture for their animals. The iconographic paintings are rich in images of Buddhas and bodhisattvas and depictions of the elaborate Tibetan Buddhist cosmology. Flowers and floral motifs twine around the figures in a fugue of motion and color. The painted subjects may be dancing, preaching, meditating or just sitting. But each detail of pose or gesture is prescribed by a reference in the vast Tibetan Buddhist scriptural tradition. The ultimate goal is to aid the spiritual development of the meditating viewer, who participates in spiritual awakening by using the painting as a mandala - a device of meditative concentration. It is not a product designed for the aesthetic satisfaction of the consumer, client or customer, as art seems to have evolved in the secular West. "When you are really into it, it is almost like a meditative state. You want to make every aspect, every detail, of the thangka perfectly correct," Tensum said. Dorjee is now acknowledged as perhaps the world's best practitioner of the art of thangka, Tensum said. His paintings have been commissioned by His Holiness the Dalai Lama (Tibet's spiritual leader in exile) and the royal family in Sikkim, a state in northern India bordering Nepal. On Wednesday, Dorjee and two other Tibetan masters of thangka, Gyurme Sonam, 38, and Ngawang Choephel, 35, demonstrated their skills and discussed their craft with the Missoulian. The question was: What really brings a thangka painting alive and makes it stand out from all the rest? Sonam, founding teacher of the Tibetan Thangka Painting School at Dharamsala, India, and Ngawang Choephel, a slim man with delicate features who made a rich tea-and-milk concoction for the visitors, had a lengthy discussion of this question - in Tibetan. "In the process of thangka, we offer a lot of prayers into the creation. The cumulative effect of many, many prayers will have a peaceful, calming effect. When an artist is creating a thangka of any Buddha, he is inviting that Buddha out of the canvas for the good of all sentient beings. When I paint with that motivation, the thangka is imbued with His (the Buddha's) prayers and good motivation." A thangka is not finished when it is completed by the artist, Sonam said. "When a painting is finished, the artist will take it to a Tibetan lama (Buddhist priest), who will imbue it with life," that is to say, consecrate or bless it, he said, through translation. Roberta Anderson, an educational psychologist and jewelry designer from Polson and a board member of the Tibetan Children's Education Foundation, helped to arrange the thangka exhibition and discussion of the plight of Tibetan refugees that will occur in Polson on Saturday. She said prominent Tibetan Buddhist leader Tulku Sang-ngag of Arlee will discuss the meaning and significance of Tibetan Buddhist art at the Polson gathering. At the suggestion of friends, Anderson visited the foundation's school for refugee children in Clement Town, Uttaranchal, India, in 2003 while on a trip for her jewelry design business. "I was impressed when I visited the school. All the children were amazingly happy. There were 100 children learning English, Tibetan and Hindi (the predominant language of India)," she said. She was so impressed that when she got back home, she immediately sponsored a child's tuition to the school. There is no admission charge for Saturday's event. Free-will offerings and sales of thangka paintings and other Tibetan arts and crafts at the Polson exhibit and one on Friday in Kalispell will benefit the school. The Tibetan Children's Education Foundation is located in Helena, and can be reached at tcef@mt.net, or on the Web at www.tibetanchildrenseducation.org, by phone at (406) 443-6078, or at P.O. Box 1403, Helena, MT 59642. Tibetan thangka artists will discuss their art form and the efforts of the Tibetan refugee community to maintain their traditional culture in exile at public gatherings in Kalispell and Polson on Friday and Saturday. Contemporary thangka will be available for purchase, with proceeds going to Tibetan refugee communities in northern India. The events are in Kalispell at Central School Museum, 124 Second Ave. E., from 5 to 8 p.m. Friday and in Polson at the Yoga Studio, upstairs at 314 Main St. from 4 to 7 p.m. Saturday.